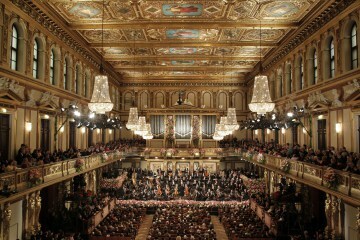 Many of the Vienna Philharmonic musicians were members of the Nazi party during Hitler’s regime, according to a report the orchestra issued March 10, 2013. Further, the orchestra delivered one of its most prestigious awards to a Nazi war criminal two decades after the end of World War II. The Philharmonic has long been under fire for hiding the details of its Nazi past; the report includes biographies of Jewish members who were driven out and sent to death camps. Among the most startling revelations was the origin of its famed New Year’s concert, which today is broadcast to an audience of more than 50 million in 80 countries. It was designed as a propaganda vehicle for the Nazi party. The orchestra held the release of its report until its return to Austria from its U.S. tour earlier this month. This entry was posted in Symphony Orchestras and tagged Adolf Hitler, Austria, Jews, Nazi, Nazism, Vienna, Vienna Philharmonic, World War II. Bookmark the permalink.